I think I have this one in the Skull Face omnibus ... can't remember any of the details of the story, but your notes whet my appetite! I'll hunt through my boxes right away. This story seems to have everything I love. I just put El Borak and Other Desert Adventures on hold at the library. This sounds terrific! I know this story is in his Cthulhu Mythos collection Nameless Cults, edited by Robert M. Price. I have to look for more of his Adventure yarns. It's been years since I read it. And I don't think I've ever seen that cover. 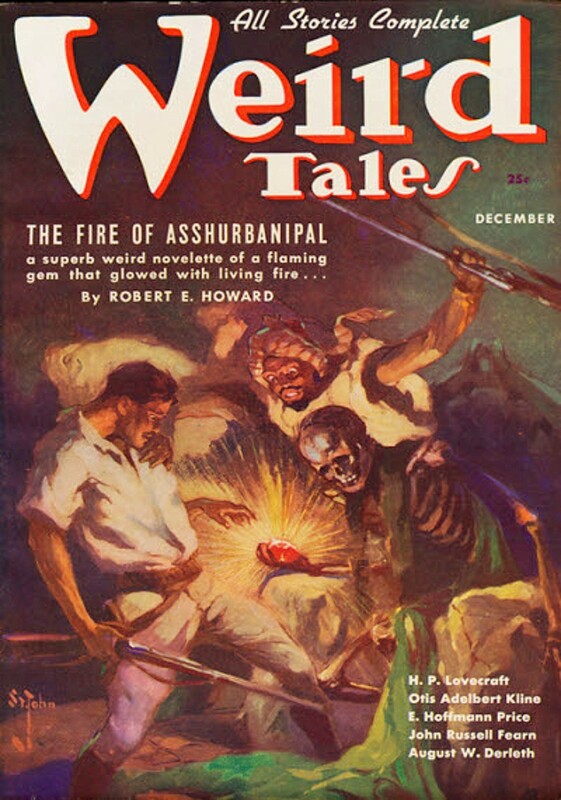 I thought I'd seen all the Weird Tales covers from that period, but either I missed one or it faded into the mists of memory. Please remember that there are two different versions of this story, one of which is overtly supernatural while the other one is a little bit more open to interpretation. Both versions are excellent. The version in El Borak and Other Desert Adventures is the (possibly) non-supernatural one, while the one in Nameless Cults is the openly Cthulhuvian one.